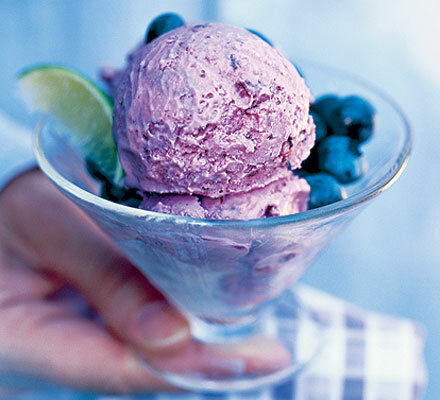 This zingy ice cream is really worth making – and you don’t even need to use an ice cream maker. Finely grate the zest from one of the limes and squeeze the juice from both. Put in a small pan with the sugar and heat gently, stirring to dissolve the sugar. Add the blueberries and simmer for 2 minutes, just until the skins start to split. Pour the blueberry mixture into a bowl and stir in the coconut cream. Leave to cool. Whip the cream in a large bowl until it just holds its shape, then gradually stir in the blueberry mixture. Put the bowl in the freezer for about 1 hour, until the mixture is set about 3cm in from the edges. Remove from the freezer and mix it all together using a whisk. When it’s fairly smooth, return to the freezer for a further hour, then repeat the whisking one more time. Transfer the ice cream to a rigid container, cover and freeze until firm, or for up to a month. Before serving,move to the fridge for 30 minutes to soften it. Serve with extra blueberries scattered over. Wenk : Hierdie resep kan jy die vrugte vervang met blueberries in dieselfde hoeveelheid. Process nectarines and sugar in a food processor 30 to 45 seconds. Transfer to a large bowl; cover and chill 2 hours. Melt butter over medium-low heat in a medium skillet; add almonds and salt. Cook almonds, stirring frequently, 3 to 5 minutes or until toasted and golden. Pour nut mixture through a fine wire-mesh strainer, shaking to remove excess butter and salt. Stir almonds into nectarine mixture; cover and chill until ready to use. Beat eggs at medium speed with an electric mixer until frothy. Stir together sugar, flour, and salt until well blended. Gradually add sugar mixture to eggs, beating until thickened. Gradually add milk, beating until blended. 3. Fill a large bowl or pan with ice; place Dutch oven in ice, and stir occasionally 10 to 15 minutes until custard is completely cool. Transfer mixture to an airtight container; cover and chill 8 hours. Stir in whipping cream, vanilla, and desired fruit blend. Jy kan dit ook maak sonder die roomys maker. Volg net die vorige resep se aanwysing van vries en klop en vries en klop.